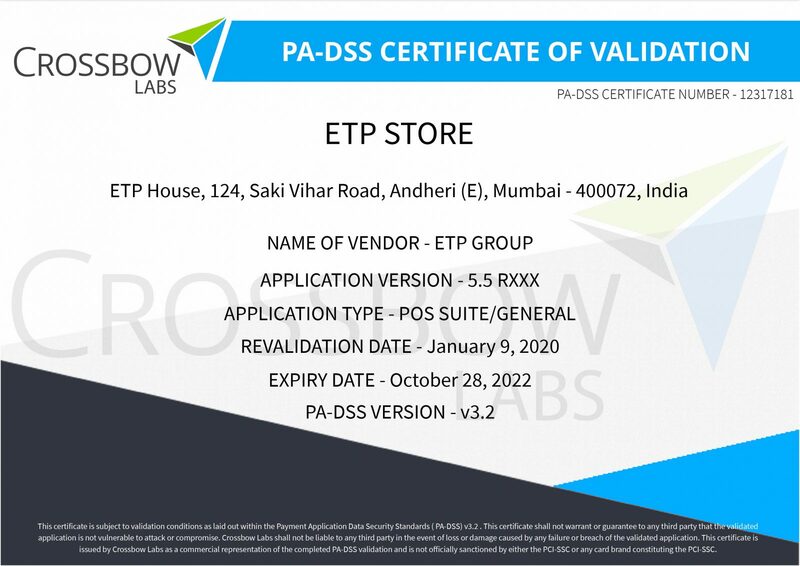 The ETP V5 Suite consisting of omni-channel retail management solutions is certified as Payment Application Data Security Standard (PA-DSS) v3.1 compliant by the Payment Card Industry Security Standards Council (PCI SSC). PA-DSS is a subset of the Payment Card Industry, Data Security Standard (PCI DSS) which is an association of credit card providers who publish security standards for parties who handle credit card information. In order to ensure that all sensitive cardholder authentication data is secure, PCI requires merchants, banks, and all other parties that use a third-party application for processing payments to select one that meets the PA-DSS standard.